'Tokyo Ghost' has been one hell of a ride. One of Rick Remender's triumphs this year as a cautionary tale of society's addiction to technology run amok. Sean Murphy continued to provide some of the best visuals in comics today. It all comes to a head as Debbie and Davey clash one last time in this exciting finale. Frankly, the ending isn't a total surprise but it's executed so well and despite the predictability is still an exciting and satisfying conclusion. There's even an opening for a sequel. Davey Trauma in his arrogant verbose way gives Debbie a choice. After much monologuing and exposition, the threat of worldwide genocide and transference into a digital after life is dealt with. Will Debbie choose to lose the digital version of Teddy and reboot the earth to a life without technology? That is the question. Regardless of the outcome, Remender and Murphy have created over ten issues a powerful parable about the all-consuming addiction of digital media in our present society. We tune out our life and loved ones around us in exchange for the next binge-worthy series, viral video, hilarious meme, Twitter feud, whatever, living an isolated life with eyes on a screen everywhere we go. In doing so, we escape not only our reality but our humanity along the way. Weaved into a story about life-long friends turned lovers, one an environmentalist and optimist, the other a constable and content junkie that becomes a puppet of Trauma. Their relationship is our guide into this cold careless world and for a moment find refuge in the tech-free Gardens of Tokyo. They rebuild their lives and Teddy gets clean. Alas, the peace and beauty of Tokyo is inevitably destroyed leading to this confrontation with the fate of the world at stake. Never let it be said that Remender doesn't think big. 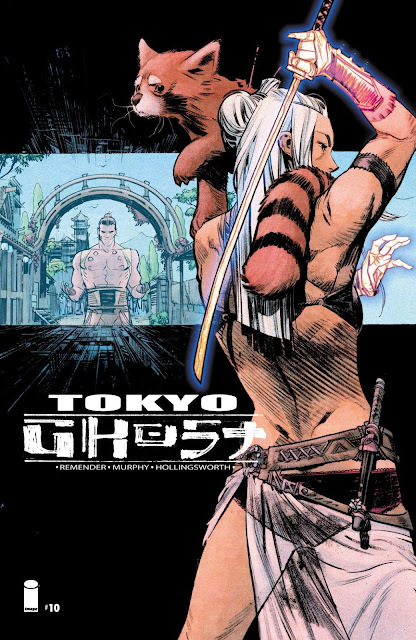 Murphy and Hollingsworth have done some of their best art on 'Tokyo Ghost.' There isn't enough praise that would do it justice. From the intricate detail of the backgrounds to the visceral action sequences to the brilliantly colored pages, Murphy and Hollingsworth have put on a clinic on how to illustrate comics. 'Tokyo Ghost' comes to a solid if not predictable end. Overall, you won't find a more exciting thought-provoking read than this limited series. It should do blockbuster business as a trade where it can all be soaked up at once providing one long riveting story to lucky readers. When you get an all-star line-up of talent to make a comic book it should exceed every expectation. 'Tokyo Ghost' has done that in spades.